No further talks are scheduled between Canada Post and the union as MPs get set to debate back-to-work legislation. There are no further negotiations on the horizon between Canada Post and the Canadian Union of Postal Workers as MPs in Ottawa get set to debate back-to-work legislation. Negotiations broke down Wednesday and Canada Post confirmed to CBC News Thursday morning that no more talks are scheduled. That increases the likelihood that the labour dispute that began earlier this month will be settled by the back-to-work bill tabled by the government on Monday. Parliament was scheduled to break for the summer Thursday but Conservative House Leader Peter Van Loan says the session will be extended as long as it takes to get the legislation passed. The NDP, however, is opposed to the back-to-work legislation and has said it will use whatever procedural mechanisms it can to drag out debate on the bill. Before MPs begin debate on the actual bill, they will first vote on a motion to allow for the proposed legislation to be passed in a shorter timeframe than usual for bills. Debate on that motion began earlier in the week and resumed Thursday morning. A vote on it is expected by about noon and with a Conservative majority in the House of Commons it will pass. Then MPs will being debating the legislation later in the day. As debate on the motion began Thursday morning, Labour Minister Lisa Raitt fended off accusations from the opposition that the government was giving a "kick in the teeth" to organized labour. Raitt said the parties have been unable to reach a deal and that the government had to step in because the dispute is affecting the Canadian economy. Canada Post said Wednesday that it can't meet the employees' demands without jeopardizing its "financial viability." The union says the Crown corporation made no significant moves and is maintaining 10 demands for major rollbacks. Opposition parties are gearing up for a prolonged and feisty debate with the Conservatives, who are determined to pass legislation ordering locked-out Canada Post workers back to work. Outside the House of Commons on Wednesday, Conservative House leader Peter Van Loan said the government hopes to vote on the legislation Thursday, but "if the other parties are determined to prolong this matter, we could be sitting through the weekend." "We will continue sitting, once the procedural motion has been adopted, continually until we finally dispose of the back-to-work legislation," Van Loan said. "How long that takes, will depend in large part on the determination of other parties to delay the end to this work stoppage. I know that if everybody wants to co-operate, we could finish as early as Thursday, or early into Friday." Talks between Canada Post and the Canadian Union of Postal Workers went on until about midnight Tuesday, and the two sides were back at the bargaining table Wednesday morning. They have since stopped all talks. NDP Leader Jack Layton said his MPs are prepared to sit all weekend and into next week to argue against legislating the employees back to work. "We intend to fight the legislation every step of the way using whatever procedural manoeuvres are possible in the House of Commons to give more time for the employer and the workers to come up with some kind of a solution here," he said. "There's only one man standing in the way of the postal service being started up again right now and that's Stephen Harper. He's got the key to the lock." Canada Post workers demonstrate at one of the busiest corners in Toronto on Wednesday. (John Rieti/CBC)Layton hinted that Harper had been involved in the decision to lock out workers. "It seems pretty obvious to me that Canada Post and the government have been in some kind of discussions, because if you just look at the way the legislation is constructed and the timing of when it was brought in, it's pretty much impossible for me to believe that there were no discussions," Layton said. "And I asked the prime minister specifically about this yesterday and he wouldn't deny it, which I thought was quite interesting." Interim Liberal leader Bob Rae said he doesn't believe "under any circumstances whatsoever that either the House or the Senate should sit on June the 24th, which is a holiday in the province of Quebec, and it's also an important day of celebration for French Canadians across the country." "We're happy to sit on a Saturday. We're happy to sit on a Sunday, but it sets a terrible precedent for us to be sitting through that kind of a holiday." When will mail service resume? Once the back-to-work legislation passes in the House of Commons, it moves on to the Senate, assuming, of course, that no deal is reached by the two sides at the bargaining table in the meantime. In anticipation of its passage in the House of Commons, Senate leaders are negotiating in advance how to deal quickly with this bill. The Senate could debate and pass the legislation in a single (one day) sitting if a procedural agreement can be reached. Consent and co-operation from the Liberal opposition in the Senate is required or else quick passage cannot be assured. The Senate is not scheduled to sit past Thursday. However, it could sit on Friday or Saturday if necessary to pass the back-to-work legislation. Once it passes the House and then the Senate, it would take effect 24 hours after the Governor General signs it into law. Mail service is supposed to restart immediately. According to the bill, both the employer and employee must resume postal service and duties "without delay." Canada Post wasn't immediately available to say whether delivery would resume 24 hours after the bill passes, or whether it will take some time to get workers back to sort the mail and get it to postal workers for delivery to homes. Conservative House leader Peter Van Loan said if the bill gets through the Commons and the Senate before the weekend, he hopes mail will resume early next week. Meanwhile, union members of all stripes rallied in the heart of downtown Toronto against the federal government's attempt to force postal workers back to work. Hundreds of people gathered at Yonge and Dundas streets in front of Canada Post's legal offices. Joining postal workers at one of the busiest corners in Toronto were members of other unions, including the Canadian Union of Public Employees and the Canadian Healthcare Workers Union. Some carried placards emblazoned with slogans like "negotiate not legislate." John Cartwright, the president of the Toronto and York Region Labour Council, said the union members at the rally were standing up for the next generation of Canadian workers who deserve the same wages and benefits his generation received. Postal workers at the rally said they would be glad to return to their jobs but are upset at the process. One of the issues with the back-to-work legislation, some told CBC News, is the deal is not as generous as the last offer Canada Post had tabled. CUPW said the last offer from Canada Post included raises of 1.9 per cent in 2011, 2012 and 2013, and two per cent in 2014. The back-to-work bill, however, sets wage increases at 1.75 per cent in 2011, 1.5 per cent in 2012, two per cent in 2013 and 2014. 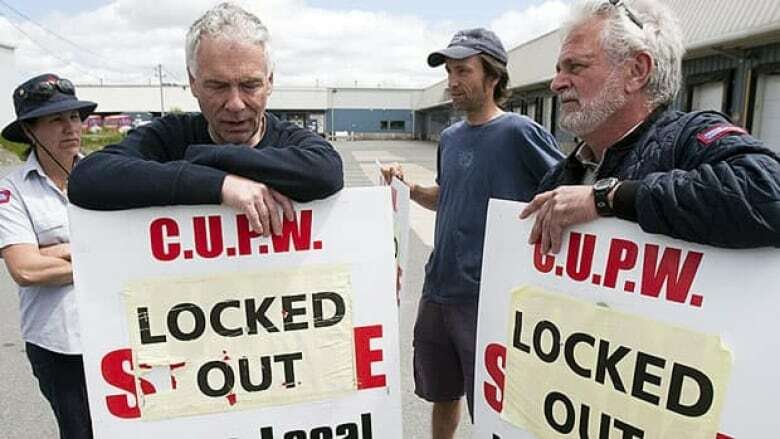 Canada Post locked out workers on June 14, after 12 days of rotating strikes launched by the union. The Crown corporation has said the main sticking point in the dispute is the union's demand for staffing levels beyond the capability of Canada Post, adding that wages were not the key disagreement. 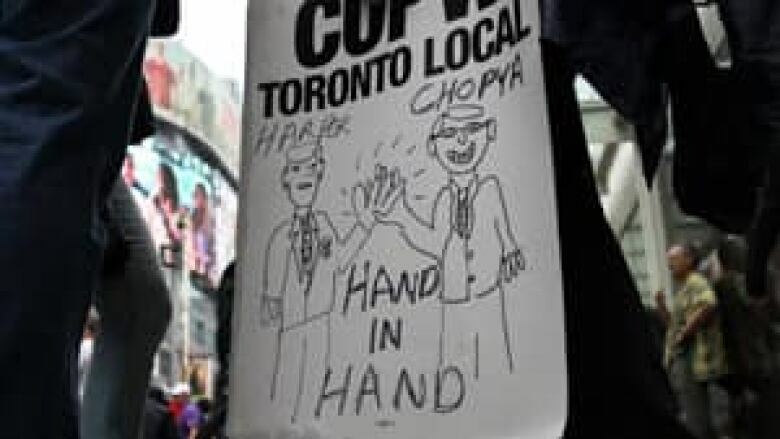 CUPW, has been emphasizing working conditions and safety issues, as well as decrying the corporation's push to have new employees receive substantially inferior wages and pensions. CUPW also says Canada Post turned a profit in each of the last 16 years.